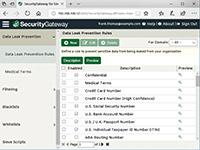 Security Gateway for Email Servers offers Protection from External Email Threats, Protection from Internal Email Threats, Administrator Options, Performance Features, and Detailed Logs and Comprehensive Reports. Security Gateway's simple and easy-to-use features analyze, manage, and report on the inbound and outbound email traffic patterns of Microsoft Exchange Server or any other SMTP email server. "SecurityGateway is under half the cost of Barracuda Virtual Firewall and has a higher catch rate. Barracuda in real time and manual testing has let in twice as much as SecurityGateway did." For customers that want control and security of their email security software. or... Hosted Cloud Email Gateway? Do you want to buy cloud based email services? Security Gateway for Email Servers is a trusted and cost effective alternative to other spam and security gateway software on the market. The chart below compares Security Gateway to other comparable products. Security Gateway can save your organization money without sacrificing features or performance. Based on 250-user license, and publicly-available pricing as of March 2019. Pricing comparison note: Security Gateway includes features at no cost that may be offered by its competitors for additional cost. In such cases, those additional costs have been included to create more accurate product price comparisons. Listed below are individual PDFs comparing the features in Security Gateway for Email Servers to other currently available spam firewall software. This information was compiled using publicly available information about each of the competitive products. 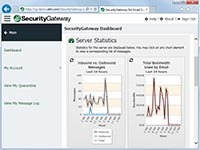 We have been using the Security Gateway for more than 2 years now. We just upgraded it to the current (as of June 24, 2014) version 3.0.1. 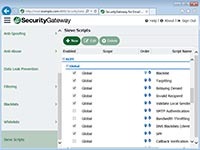 One of the best features of the Security Gateway product is its detailed logging. It is easy to install and configure (even I can do it), and has been 100% reliable so far (24/7 uptime for over 2 years). Support (unpaid free support) is not always immediate (e.g. on weekends) - but it has always been reliable, professional, and effective. Our platform: Windows Server 2012 R2 running in a Hyper-V virtual machine, 4GB RAM (dynamic). Our email servers are: Lotus Domino 8, IBM Domino 9, Zimbra, and MDaemon. Our cost for the Security Gateway for 50 Users and 25 Domains for 2 years is about $10 per user account (no charge for email address aliases) per year. The benefit of reducing SPAM delivered to users = saving a lot of users' time. 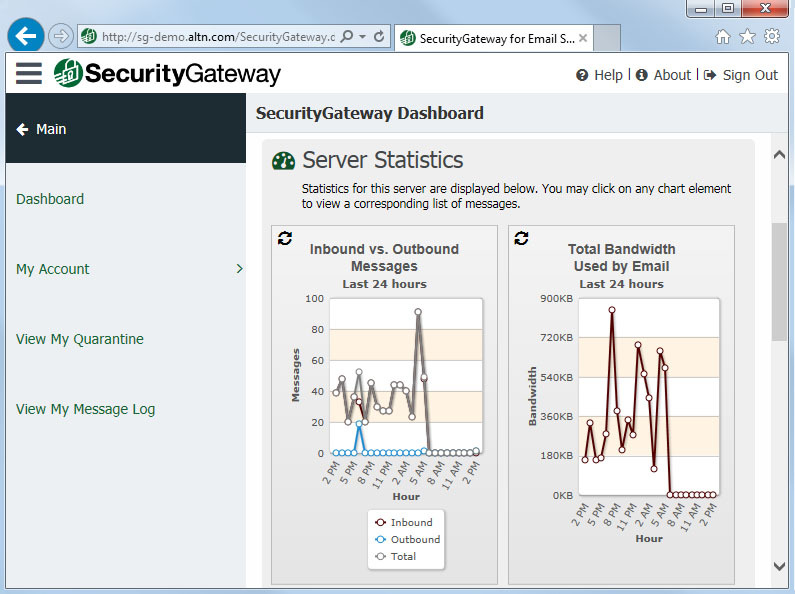 If you run your own email servers, then I highly recommend the Security Gateway! its an awesome software, i was using it with mdaemon since 3 years, its spam protection is great, although its previous versions was little bit slow and not so good as this version, i am using version 4.1.2, also it helps us in reducing the spam and AV in the emails very nice, i also tried baracuda spam, but this one was very light and has good integration with mdaemon. i have no complaint with its support however i ping them a lot with my issues, they are very fast in support and gives you better response in few hours and very help full also. 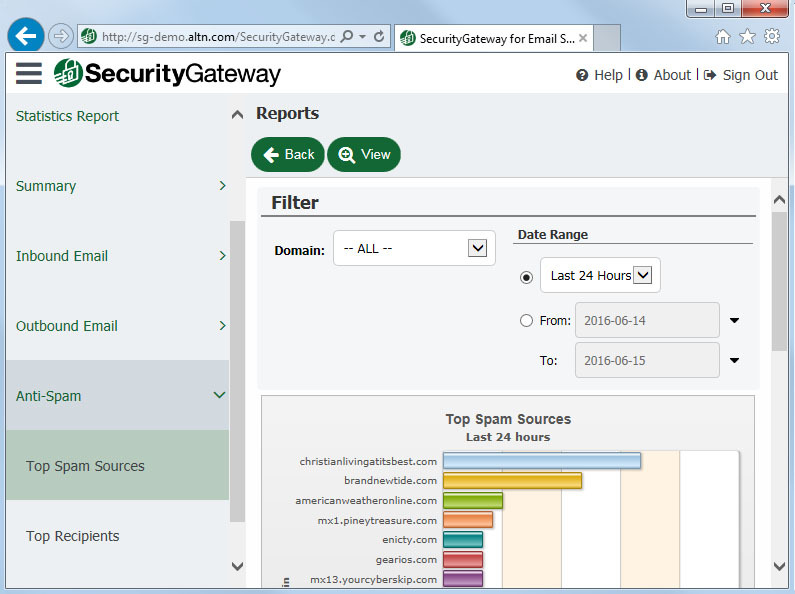 Security Gateway for Email Servers offers easy administration, powerful filtering, and accurate results. To see for yourself, put it to the test with our Interactive Virtual Demo. 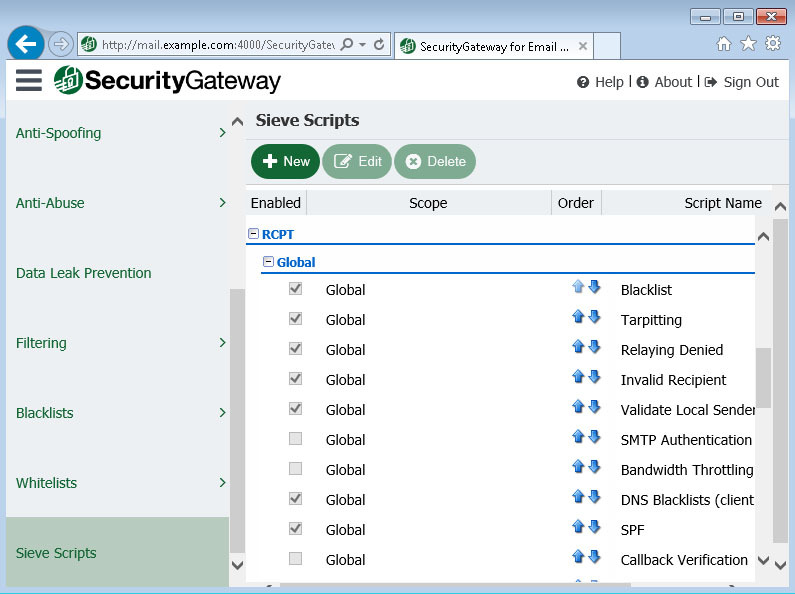 Take a look at our newest features in Security Gateway for Email Servers. 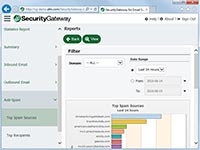 Download your free 30 day Security Gateway trial today and see it in action.